A trove of new artifacts have been recovered from the Roman-era wreck that yielded the mysterious Antikythera Mechanism, including an arm made of bronze and a strange metal disc. But most intriguing of all, the latest survey suggests that seven bronze statues are still waiting to be discovered. The Antikythera shipwreck is the gift that keeps on giving. The latest expedition, led by the Greek Ephorate of Underwater Antiquities, Lund University, and Woods Hole Oceanographic Institution, was conducted between September 4 to 20, and as per previous trips to the wreck, the team did not leave disappointed. With excellent weather conditions above them, the divers managed to recover an “orphaned” right arm of a bronze statue, pottery shards, nails, lead sheathing fragments, and an odd metal disc, among other artifacts. 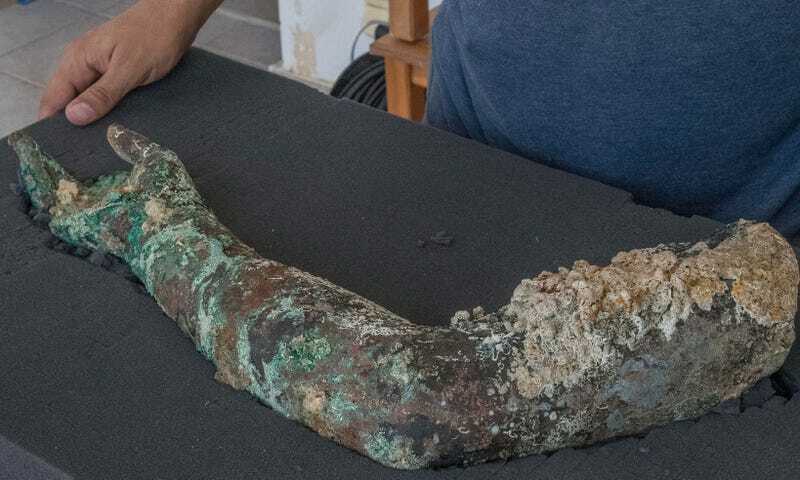 Excitingly, scans with a metal detector indicated the presence of at least seven undiscovered and priceless bronze statues buried near the sunken ship, which sank off the Greek island of Antikythera in 1 BC. The doomed vessel was filled with art pieces and luxury items, including the Antikythera Mechanism—a geared device used to predict astronomical events such as eclipses and the movements of the Sun, Moon, and planets. The 50-foot-long Roman-era ship sunk near the tiny island between Crete and Peloponnese. Prior to this latest expedition, the Return to Antikythera project team managed to recover glassware, luxury ceramics, anchors, counterweights, tools, and even an ancient skeleton (which is currently being analyzed for DNA). During the recently concluded trip to the wreck, divers investigated areas where fragments of marble and bronze statues had been found before, and which were located near and underneath large stone boulders. Regrettably, the wreck happens to be located on a slope, and over the years, a succession of earthquakes has delivered numerous rocks and boulders to the site. One of the more interesting items pulled from the wreck is a sediment-encrusted metal disc measuring about eight centimeters across, and with four metal arms with holes for pins. At first glance, the archaeologists thought it might be related to the Antikythera Mechanism, specifically a missing gear that was likely used to calculate the positions of the planets. But after performing an x-ray analysis of the disc, the researchers realized it wasn’t a gear at all, but some kind of decorative object adorned with the image of a bull. They suspect it was attached to the shield of a statue, or even to the ship itself. The researchers also found part of a bronze robe or toga, fragments of the ship-shell (namely bits of the skeletal frame and planking), and a bare leg attached to a base that was lodged underneath a boulder. The discovery of the bronze arm, plus the metal detector findings, boosts the number of bronze statues suspected to reside at the site. Bronze statues are exceptionally rare, with only about 50 known to reside from this period. During both the classical and medieval eras, bronze recycling was an important industry—one that resulted in the destruction of countless statues and other artifacts that would, by today’s standards, be priceless. Ironically, some of the finest bronze relics from this era were recovered from shipwrecks. Once these suspected bronze statues are located, a truly herculean effort will be required to pull them out. The archaeologists have several options, including hauling the rocks up or fracturing them into smaller pieces. Regardless, it’ll be a slow, costly, and tedious process. The next expedition is planned for the spring of 2018, at which time the archaeologists plan to explore the hold of the sunken ship.